Casey Benjamin’s jade charm depicts the Buddha, a symbol of compassion, empathy, and radical acceptance. Two-time cancer survivor Casey Benjamin believes that the jewelry you wear every day can bring "good juju" into your world. 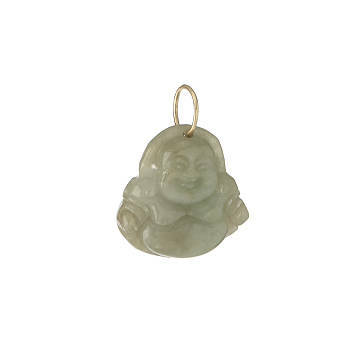 Like this charm depicting the Buddha, a symbol of compassion, empathy, and radical acceptance. It's carved from jade—for bonus positive vibes. The stone has been used for healing since ancient times, and is believed by some to promote restoration and purification. Charm: 3/4" L x 3/4" W Chain: 18"